The Nintendo 3DS sounds revolutionary, but its eye-popping effects could be undone if players aren't perfectly still. Now that 2011 has hit, the Nintendo 3DS is on its way and set to blow the minds of gamers everywhere with glasses-free 3D display technology. That is, if it's kept still enough. 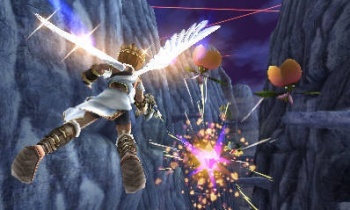 Masahiro Sakurai, the designer of 3DS title Kid Icarus Uprising, has been tweeting about the upcoming device and recommends that it be kept in a fixed position during play. Shaky hands, overzealous button presses, or violent stylus taps could prevent the 3D effect from displaying properly. The reason is because of how the 3DS works. It doesn't use magic, holography, or alien technology (probably), but a technique that sends a different image from the screen in two directions to each eye to create the illusion of 3D. According to Sakurai, moving the system around too much could create issues. I'm going to go ahead and say that Nintendo has likely worked out a system where tilting or moving the 3DS slightly won't be an issue during gameplay, but Sakurai's tweets do raise some questions about the operation of the 3DS. Is it simply that the 3D effect will display better when the 3DS is kept fixed? How much wiggle room is there to move the system around during play? I'm wondering why Sakurai brought the topic up if it won't become an issue for some gamers, though perhaps he's only making a recommendation for ideal play conditions. We'll find out in a few months.